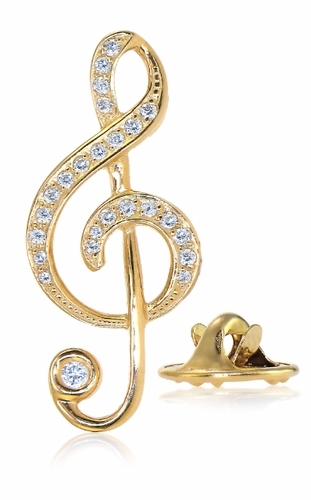 Our Treble Clef Music Note Pave Set Diamond Quality Pave Set Cubic Zirconia Pin is the perfect gift for anyone who has a love for music or composition! 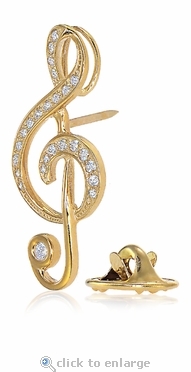 This beautifully detailed diamond look Treble Clef Music Note Pin is set in 14k gold and features pave set round Russian formula high quality cubic zirconia stones with additional beaded detailing for a sparkling look! This treble clef note pendant measures approximately 35mm in length and 15mm in width at its widest point, that's about 1.5 inches tall and just over half an inch wide. This pin comes standard with a stainless steel industry standard gold tone clutch for the post and is perfect to wear on your lapel or necktie for a man or with a scarf or on a dress or suit for a woman. This item is also available as a treble clef pendant, please see item P1172YGCL. 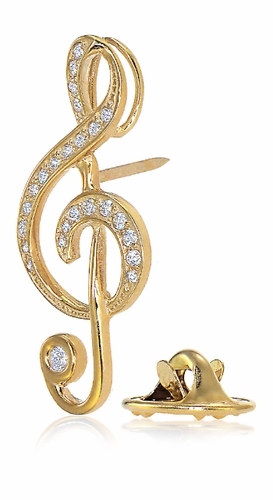 The Treble Clef Note Pin is available in your choice of solid 14k yellow gold with a gold tone clutch or 14k white gold with a silver tone clutch.